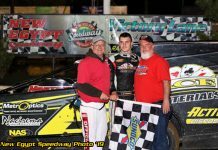 ST. LOUIS, MO – Josh Harris and Kenny Wallace both picked up big wins on Friday night in the UMP modified division at the 3rd Annual VP Gateway Dirt Nationals. In the first 20 lap feature, it was Harris who jumped out to the early lead and never looked back, claiming the $3,000 top prize and locking himself into Saturday’s main event along with Ray Bollinger, Mike McKinney and Chad Sellers. Brent Mullins rounded out the top five, but only the top four advanced directly into Saturday’s main. 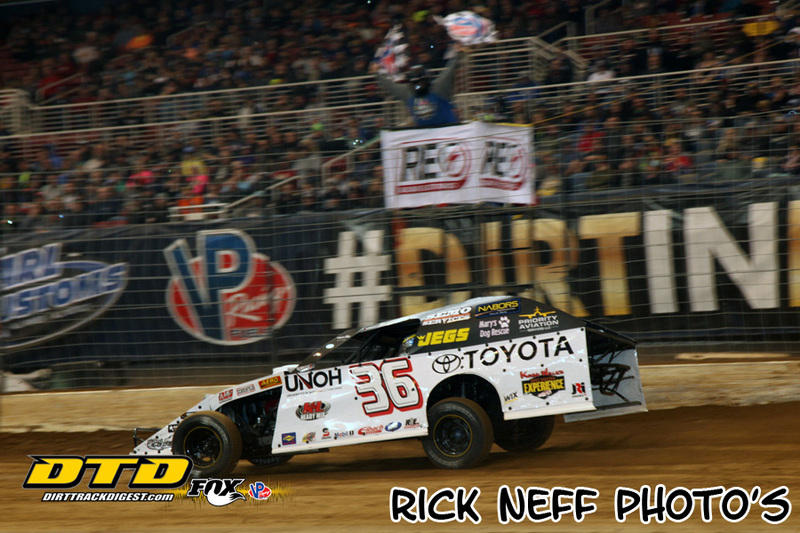 In the second 20 lap feature, Kenny Wallace used his pole starting position to his advantage as he lead all 20 laps in route to his first ever win inside the Edward Jones Dome in his hometown of St. Louis. Dean Hoffman finished in second, with Nick Hoffman and Trey Harris claiming the remaining guaranteed starting spots in Saturday’s feature.